Several significant and potentially catastrophic complications can occur after a laparoscopic Roux-en-Y gastric bypass (RYGB). Early complications include anastomotic leaks and hemorrhage, followed by internal herniation with possible small bowel ischemia, fistulation, ulceration, and nutritional and metabolic complications. Other complications include deep venous thrombosis and pulmonary embolism, skin and neurological complications, and cholelithiasis. Bariatric patients may have elusive and non-specific clinical signs and their weight may restrict the types of imaging investigations available. All these factors may make it difficult to detect complications when they occur. Hence, it is important that the treating surgeon have a high index of suspicion for complications in any bariatric patient, both when postoperative progress does not appear to be following the usual course, and in those presenting with unmanageable pain, fever or tachycardia. It is also important for the patient to be educated of the potential changes in a normal postoperative course. They should be advised that they or any other treating clinician should contact the primary bariatric surgeon in case of any untoward symptoms in the postoperative period, as these may be related to their operation, even if not obvious in the first instance. In the early postoperative stage, if there is any doubt about potential abdominal complications, a diagnostic laparoscopy should be performed without further delay, since these patients can deteriorate very quickly, and abdominal scans may often be unhelpful and/or falsely reassuring. The complications of RYGB, their incidence, presentation, diagnosis and management are discussed in this chapter, and in addition, some tips for their prevention are provided. Northcote C. Parkinson quotes [internet]. Available from:http://thinkexist.com/quotation/delay_is_the_deadliest_form_of_denial/253524.html. Narula VK, Mikami DJ, Hazry JW. Endoscopic consideration in morbid obesity. In: Principles of Flexible Endoscopy for Surgeons. Springer US, New York. 2013. p. 139–55. http://www.springerimages.com/Images/MedicineAndPublicHealth/1-10.1007_978-1-4614-6330-6_13-12. Pieracci, Pomp Alfons, Barie PS. 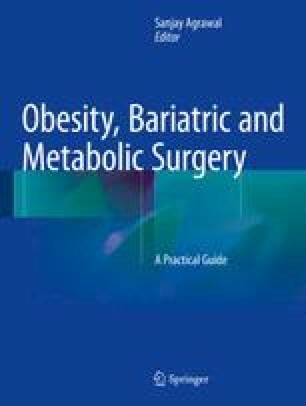 Postoperative care after bariatric surgery. In: Surgical Intersive Care Medicine. Springer US; 2010. p. 577–89. http://www.springerimages.com/Images/MedicineAndPublicHealth/1-10.1007_978-0-387-77893-8_49-3.